Evidently, Hyper Sentinel is inspired by a game called Uridium, originally released for the Commodore 64 in March, 1986. I have never played it, myself, but it’s a unique take on the shmup genre. 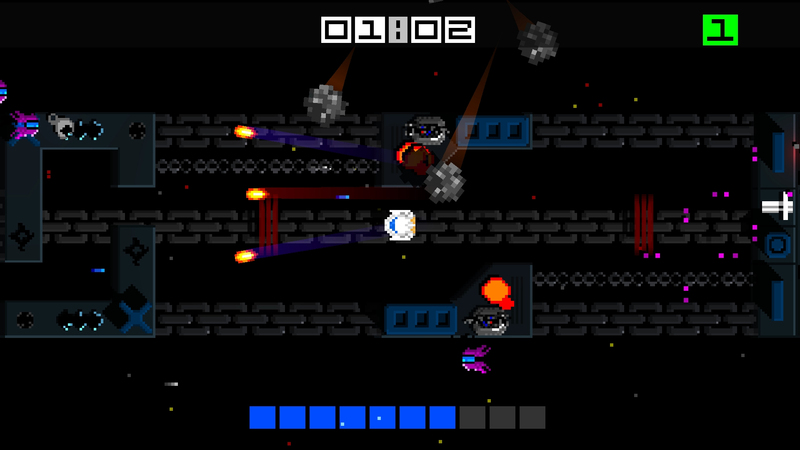 Players must fly in contained areas and destroy dreadnoughts. I never even heard of it until I did some reading about Hyper Sentinel but I get the feeling it’s a cult classic and in addition to being released on the Commodore, it was ported to numerous other systems over the years including NES and DOS. Although, I hear the Commodore version is still the best. According to the game’s Steam page, Hyper Sentinel was developed by Four5Six Pixel and Huey Games and published by Huey Games. It was released in May, 2018 for PC, Switch, Xbox One, and PlayStation 4. For this review, I played the Steam version. From what I’ve seen of Uridium, I would say Hyper Sentinel is more or less a modern take on that formula. There really is no story, at least as far as I can tell. There’s no characters or any form of narrative. This is an arcade shoot ’em up and a fast-paced one at that. The Arcade mode is like the story mode if you will and you’ll want to play through it to unlock the other modes for each sector. The entire goal of the game is to destroy Alienoid space destroyers. You fly a sentinel ship left and right and use the ship’s boost engines to fly at high speeds. You can’t shoot while boosting but you’ll want to utilize it to quickly escape death or even to chase down a Powerdroid. You’ll be getting attacked from every direction and switching left and right also doubles as dodging but it’s all about timing, otherwise you’ll take damage. When you take damage you lose energy but if you can stay out of harm’s way for long enough, your energy will regenerate and that seems like a significant mechanic. The gameplay can get pretty intense but knowing you can just hang out in the corner and wait for your energy to regenerate kind of alleviates some of the challenge, but it also eliminates frustration. I do think an option to turn that off might be welcome. Energy does regenerate at a slower rate on higher difficulties. If you die, you have to restart the entire level. The sentinel is equipped with twin laser cannons but you can acquire Bubble Power-Ups and Powerdroids that appear throughout the levels. The Bubble power-ups include an Energy restore which is like a health pickup, a shield that makes you temporarily invulnerable, and a Smart Bomb that clears the screen of enemies. The Powerdroids are temporary weapon power-ups that are more powerful than your standard laser cannons. You can fire a bunch of green lasers, three explosive type projectiles, some kind of ball and chain thing, a rear fire weapon, and these two extremely powerful laser beams, and there’s one that lays down a trail of what I think are explosives behind your ship. I don’t know the official names of any of these weapons but some of them are better for specific situations, although those laser beams can decimate anything. You won’t know what power-up will spawn and when so you will have to master dodging to truly be successful and stay alive. The game is all about high scores. Killing enemies rewards you with points and killing multiple enemies in a row increases your multiplier. Your total score for a level is based on your performance and the better you do, the better chance you have at reaching the top of the leaderboards. The game consists of five sectors, most of which contain multiple levels each. Unfortunately, the game can feel rather short if you’re not into setting high scores. You can possibly blast through each sector in a few hours. If you complete a level in the Arcade mode, you unlock the Survival and Boss Run modes for that level and you’ll have to do this for each difficulty of which there are three – Normal, Hard, and Retro. You can acquire medals in each level for meeting specific requirements like destroying all Alienoids, running down a certain amount of enemies at full boost, destroy all ground cannons, and things of that nature and they are shared between difficulty modes. In the Survival Mode, you need to survive endless waves of enemies and if you can do so within the goal time, the Survival portion of that level is considered “completed”. Survival gets more challenging the longer you survive and it can be very frantic. It kind of feels like you’re in the middle of an epic space battle except everybody is targeting you. This mode will throw almost every enemy type at you no matter which level you choose. The Boss Run mode is exactly what you would expect. You engage bosses in succession. However, in the Boss Run mode, you don’t have the luxury of destroying the ground forces first like in Arcade mode so you’ll have to contend with them, the flying enemies, and the bosses all at the same time. Bosses or what the game calls Guardians appear at the end of every level in the Arcade mode and these battles are one of the highlights of the game. Most of the bosses are large, have multiple phases, and their own unique attack patterns. They are challenging but as stated before, once you realize you can fly to a corner or the other end of the area and just wait for your energy to regenerate, you can basically cheese the Guardians. The objective in every level in the Arcade mode is to destroy the ground targets on the Space Destroyers. After destroying all the ground targets, you’ll have to battle a Guardian. 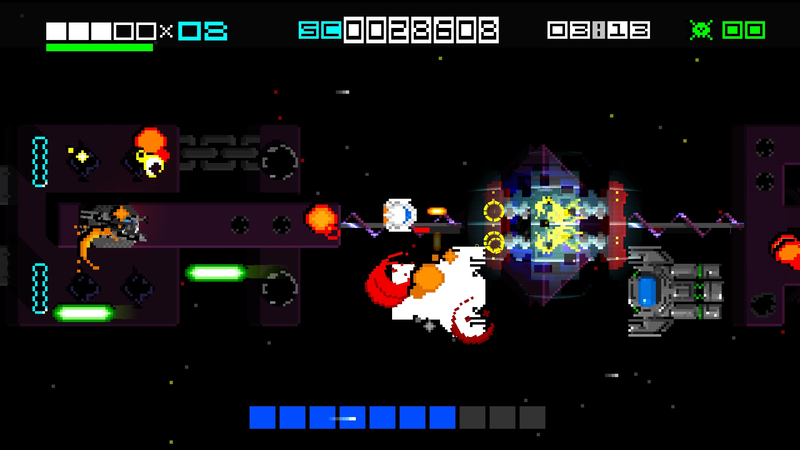 Once the Guardian is defeated, the Space Destroyer blows up and you move onto the next level. However, in addition to the ground targets are cannons and sometimes moving walls, barriers, or whatever they are that can block your attacks, block your path, and even turn you around. Some levels include Sentry Guards which fire these massive lasers that can do major damage so you need to watch out. You’ll always be moving and to succeed in this game you’ll need switch directions frequently, as well as dodge, and pay attention at all times. The flying enemies will come from left, right, and even from hatches that open up on the Space Destroyers. The flying types basically appear at random. Some of them fly in formations and sometimes Powerdroids are within the formations. I know the names of some of the enemy types and they do differ in their behavior. Bluebird Class Ships are slow but are accurate with their shots. Horde Class ships are unleashed in swarms when a Space Destroyer is crippled. Hunters have no weapons but are extremely agile and can kamikaze right into you. Alienoids change colors and grant you bonus points if you can kill them. The Grasshopper Class ship is green, agile, and is basically a fast moving fighter. There’s several other ship types and they’ll all be flying at you all the time. Later levels introduce spiked mines just floating around and asteroids that will come crashing into the Space Destroyer or your ship if you’re not paying attention. Mastering the dodge mechanic is crucial for survival, especially on the higher difficulties. Visually, the game is represented in an 8-bit style so everything is pixelated and looks rather simple. It is pretty colorful and there’s a bunch of visual filters you can apply if you so desire. There are some neat little effects like the lights emitting from the front of the sentinel and enemy ships, parts of a Space Destroyer may be on fire, the scrolling background makes it feel as if all the action is happening at high speeds, parts of boss ships may glow, and you’ll see a trail of smoke emitting from your ship when you’re low on energy and boss ships when they’re low on energy. I would say the entire visual presentation nails the retro look while adding a few touches to remind you it’s a modern game. Hyper Sentinel sounds like your typical classic arcade shoot ’em up with all kinds of beeps and electronic sound effects and the music is actually quite good. It’s full of these electronic sounding tunes that fit the action and aesthetic well. I’m happy to say the game ran very smoothly throughout my entire experience. I didn’t notice any hiccups, glitches, or frame rate dips. There’s been some really cool shoot ’em up games released recently including Infinos Gaiden, Super Hydorah which I believe is just an enhanced version of a free game, and I’m really looking forward to some others on the horizon, the big one being Xydonia. I usually come across more modern shmups accidentally, especially the indie ones, while browsing or looking for something else, and that’s how I discovered Hyper Sentinel. This is a very fast-paced shooter and I love the concept. Blowing away aliens and destroying massive Space Destroyers. It’s not your typical side-scroller, either. You’re free to roam within a contained area but you will have to contend with an onslaught of attacks from every direction at all times meaning you constantly need to be alert. I had a great time with this game but I have no idea how it compares to Uridium since I haven’t played it. I like how easy this is to pick up and play, how it can be enjoyed for five minutes or five hours, and I think one of its biggest disappointments is that there’s no co-op of any kind. Hyper Sentinel includes a Mixer Mode which apparently is designed for streamers. 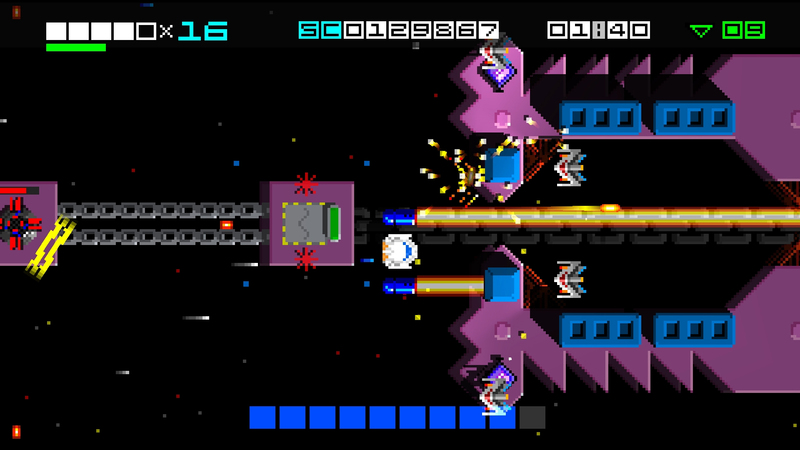 Mixer mode allows viewers to interact with the game and launch enemies, asteroids, and power-ups into the game to attack or assist the streamer. That sounds pretty cool, I guess. We don’t stream anything so I really can’t comment on it. I actually acquired the Switch version first and then double-dipped and acquired the Steam version for this review. This is actually a great game to get on Switch just due to the console’s mobile capabilities. Because the gameplay is fast-paced and addictive, you may want to have it with you wherever you go. The Steam or PC version is just as good and I would recommend either version. If this looks like fun definitely check it out because it is.